conversation starters at family reunions. We can print any size you need for your family. We believe that everyone should be able to have their own distinctive style of printed genealogy chart, so we don't try and make your data fit into a boilerplate family tree chart that we've already designed. Instead, we print directly from your data and the software that you used to design your chart. This means you can have any type of genealogy chart that you'd like - printed exactly the way you want to see it. If you haven't already designed your chart, we can do it for you at a very affordable rate. Here are some of the most common large format genealogy charts that we can print directly from your own design, or that we can design and print for you. Depending upon your genealogy program, these charts can be printed in a vertical, standard or fan layout. Unless you specify differently, most charts will usually show each individual's name along with their dates and places of birth, marriage & death when known, except in situations where you are ordering a circular or semi-circular ancestor or descendant fan chart that you wish to be very small in size. If you're designing your own chart, your genealogy software program may lay out your information differently than the examples shown below; however, since we can print from most any genealogy software program, the actual design is not an issue for us. A vertical ancestor chart starts with a single individual at the bottom center and then branches upward to show his or her parents, grandparents, great-grandparents, great-great-grandparents, and so on. The orientation of this type of chart is bottom-up and is displayed in landscape format. Most genealogy software programs refer to this type of chart as a vertical ancestor chart or vertical pedigree chart since the flow of information is vertical. This is the most common layout for ancestor charts once you go past 5-6 generations and a standard left to right pedigree chart becomes to tall to display. Here are some examples of vertical ancestor charts. A pedigree chart is similar to a vertical ancestor chart in that it starts with a single individual, but it differs because the orientation is left to right in portrait mode as opposed to bottom to top landscape mode. It begins on the center of the left side of the page and then branches to the right to show his or her parents, grandparents, great-grandparents, great-great-grandparents, and so on. This is a popular layout for ancestor charts that only include 5-6 generations. Once you go past 6 generations, the chart will become too tall to display in most situations. At that point, you should consider a vertical ancestor chart which is presented in landscape format or a bow tie chart. Here are some examples of pedigree charts. A bow tie chart is yet another variety of ancestor chart and is similar to a standard pedigree chart. It starts with a single individual somewhere around the center of the chart and then shows all of his or her paternal ancestors branching out towards the left and all of his or her maternal ancestors branching out towards the right. This normally reduces the height of a standard pedigree chart by half. Once you go past 6-7 generations, the chart will become too tall to display in most situations. At that point, you should consider a vertical ancestor chart which is presented in landscape format. Here are some examples of bow tie charts. An ancestral fan chart can be designed in either a full circular display or a semi-circular display depending upon the number of generations and the amount birth, marriage, and death information that you want included on your chart. The starting individual is in the center, and each successive ring contains the parents, grandparents, great-grandparents, great-great-grandparents, and so on until the outer ring of the chart is reached. Fan charts compact the layout the most and can be used to show up to about 8-9 generations of ancestors. Once you go past 8-9 generations of ancestors, you will want to consider a vertical ancestor chart. Photos don't work well in fan charts and should be avoided. Here are some examples of ancestor fan charts. Descendant charts are usually formatted and displayed from the top down in a landscape layout and are usually very wide. A descendant chart is normally the type of chart which is displayed at a family reunion. The starting person who is usually a great-great-grandparent is located at the top center of the chart, and then each successive generation and whom they married is shown one line below. A typical descendant chart for a family reunion is about 20-50 feet wide, although we also routinely print charts that are 100 and even 250 feet wide for larger families. By the same token, some descendant charts are only 10-15 feet wide. Photos of each individual, when available, are a popular item to include in a descendant chart. Here are some examples of descendant charts. A descendant fan chart can be designed in either a full circular display or a semi-circular display depending upon the number of generations and the amount birth, marriage, and death information that you want included on your chart. The starting individual is in the center, and each successive ring contains the children, grandchildren, great-grandchildren, great-great-grandchildren, and so on until the outer ring of the chart. Depending upon the size of the family and the amount of information which you want in each box, a descendant fan chart can normally include 6 to 9 generations. Once you go above this level, you will need to use the traditional descendant chart which is presented in landscape mode. Photos don't work well in fan charts and should be avoided. Here are some examples of descendant fan charts. An hourglass chart starts with a single individual somewhere around the center of the chart and then shows all of his ancestors above him and all of his descendants below him. Depending upon the size of the family and the number of generations of ancestors and descendants you select to be shown, hourglass charts are normally wide like a descendant chart or vertical ancestor chart. Hourglass charts are typically used for just a few generations of ancestors and a few generations of descendants, but can include numerous generations of ancestors. For example, you may want to start with yourself and show10-15 generations of your ancestors and 3-4 generations of your descendants. Here are some examples of hourglass charts. All-in-one chart - An all-in-one chart includes everyone in your database and is normally very large. While this may sound attractive, it starts becoming impractical once you have over about 500 to 800 names in your database. We routinely receive phone calls and email requesting a quote for an all-in-one chart which would include 10,000, 20,000, or 30,000 names. Generally speaking, the size of such a chart would be about the size of a football field or larger and the cost would be about the same as you'd pay for a new car. Once you have a substantial number of individuals in your database, you should be thinking in terms of doing an ancestor chart and possibly one or more descendant charts. For example, you may want one of the descendant charts to include all of the descendants and their spouses starting with the oldest ancestor on your father's side, and then a second one showing all of the descendants and their spouses starting with the oldest ancestor on your mother's side. These charts would show all of your aunts, uncles and cousins. Extended family tree chart - An extended family tree chart is an interesting design concept available through the new versions of Family Tree Maker. Although this type of chart does allow you to include extended family members such as cousins, aunts and uncles, it usually also includes more extended family members than you want and it results in an extremely large chart. Like an all-in-one chart, an extended family tree chart can include everyone in your database, but the difference is that you can select only a certain number of generations to show and everyone who is of the same generation is kept on the same horizontal plane. Just like with the all-in-one chart, an extended family tree chart starts becoming impractical from a size and cost viewpoint once you have around 500 to 800 relatives in your database. Blank ancestor fan charts - An blank ancestor fan chart is one of the basic tools that most successful family historians use because it allows you to see your progress very clearly. These fill-in-yourself charts come in a variety of styles. We have the world's largest selection of blank ancestor fan charts for you to choose from. There are also many other examples of printed family tree charts on almost every page on our site, so please take the time to browse around for awhile. There are even a few examples of charts with a photographic background on our page about enhancing your chart. We've also included several tips to keep in mind on our page titled submitting your order that you might find helpful as you go about designing your chart. The most important thing to keep in mind as you choose your chart type and layout is that you're not in competition with anyone else. If you don't have photos or graphics to add to your chart, don't worry about it. They will have little impact on the value and usefulness of your printed genealogy chart. The vast majority of people in your family will be both happy and amazed just to see the family tree printed, organized, and presented in a way that is easily understood. 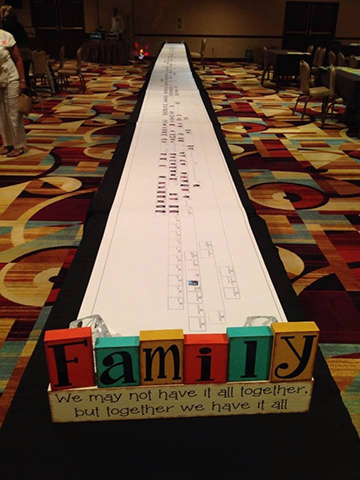 Regardless of its size, a printed genealogy chart is a hit at any family gathering. We're so sure you'll love our genealogy printing services that we confidently provide a complete money back guarantee on all orders. We look forward to being able to work with you and your family. Please call us at 630-653-8400 or e-mail us at sales@ancestryprinting.com if you have any questions about our blank family tree charts or submitting your order. International callers can also Skype us if preferred; however, we ask that you email us to set up a convenient time for a Skype to Skype call. We are located in the central time zone of the U.S. (GMT/UTC-6 and -5 in the summer), and can make arrangements for incoming Skype to Skype calls up to around 10:00 PM local time on most nights. We only accept Skype to Skype calls that have been pre-arranged by email. And, if you haven't already done so please watch the video about our services.